Top 10 Spring Events in Washington, D.C.
Spring is the prime season of the year to visit Washington, D.C. Dozens of events are held this time of year throughout the city, including cultural events, spring garden tours, wine festivals, parades and more. Don't miss these top spring events in Washington, D.C.
Washington Cathedral's May outdoor festival for garden enthusiasts and families features annuals, perennials, landscape exhibits, Olmsted Woods and Garden Tours, and children's activities such as a rock wall, moon bounce, mini-Ferris wheel and a century-old restored carousel. The Easter Monday event invites kids of all ages to hunt for and race Easter Eggs on the White House Lawn while enjoying a morning of storytelling and a visit with the Easter Bunny. The President and his family participate in this seasonal event. Free tickets are required and distributed in an online lottery. 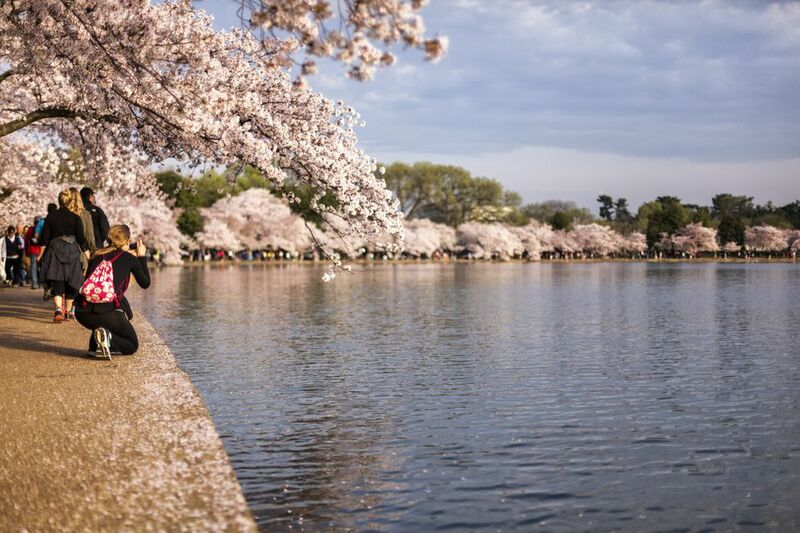 In late March and early April, Washington, D.C. showcases its thousands of blossoming cherry trees with its annual two-week, city-wide event featuring more than 200 international cultural performances and over 90 other special events. Among the most popular events are the Blossom Kite Festival, the National Cherry Blossom Parade and the Japanese Street Festival. Each April, millions of Americans participate in the annual fight for a clean environment. The Washington, D.C. metropolitan area has a variety of Earth Day activities that make caring for the planet fun for all ages. You can pitch in and help clean up a park or attend a family event that includes learning ways to improve our environment and make a difference. In May, celebrate the history of wine in Virginia with special evening tours of the Mansion and cellar, appearances by “George and Martha Washington”, and live music on the east lawn of George Washington's Mount Vernon home overlooking the scenic Potomac River. Washington, D.C.'s embassies open their doors to the public during a two week event in May called Passport DC, a new annual celebration of international culture presented by Cultural Tourism DC. Passport DC will showcase Washington DC’s embassies and cultural organizations with a wide range of performances, talks, and exhibits. The May street fair in celebration of Asian Pacific American Heritage Month showcases Asian art and culture with live musical performances, Pan-Asian cuisine, martial arts and lion dance demonstration, a multicultural marketplace, cultural displays and interactive activities. The Memorial Day weekend marks the beginning of the summer season and the Washington, D.C. region celebrates with wreath laying ceremonies, the National Memorial Day Parade, a special concert on the U. S. Capitol grounds, the Rolling Thunder Motorcycle Rally and more. This June event is one of the largest and longest-running wine festivals on the East Coast featuring tastings by more than 50 wineries including over 250 award-winning Virginia wines, educational seminars on food pairing, fine art exhibits, children’s activities, food and live entertainment. The DC Jazz Festival in June features more than 100 jazz performances at concert venues and clubs throughout Washington, D.C. Celebrating musical styles from Bebop and Blues to Swing, Soul, Latin and World music, this June festival includes performances at the Kennedy Center, the Phillips Collection, on the National Mall, and at more than 30 museums, clubs, restaurants, and hotels.